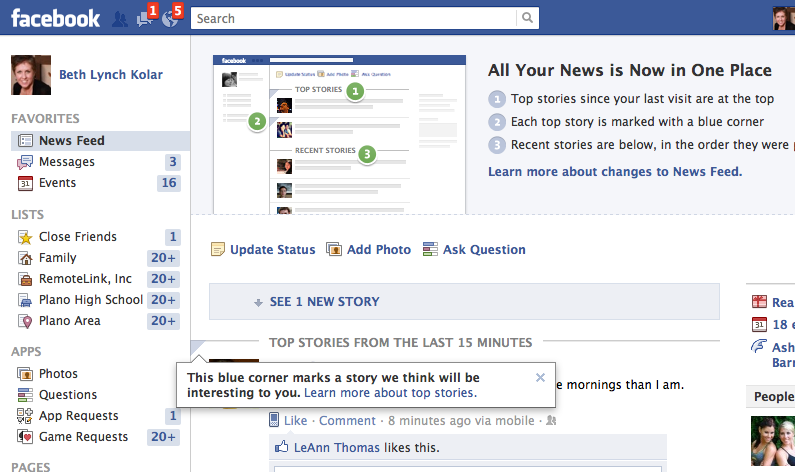 Lots of posts today about not understanding / hating the new facebook layout. ACK! I wasn’t expecting to have to learn an entire new system this morning. For me, however, it’s my job. For most of you, it’s just a way of keeping on top of what your friends or favorite brands are up to, struggling with, offering and needing, right? So, ick. I don’t know how realistic the “Social Networking” movie was – or how true to the character’s persona it came. But IF it was close to true, then lots of changes make sense and should be expected. This product is driven by trying to figure out (and write a program to do it) human behavior as perceived by its creators. Not to mention the fact that in business, if you are standing still (read:not changing / growing) you are dying. But really. This is a free service. You aren’t paying Facebook to develop what you want. Advertisers and the developers themselves are. And what seems like a nuisance to you and me, can be a major break through for a developer. That’s realistic right? What I am not saying: “Stop whining.” On the contrary, advertisers want you on Facebook so they want you happy and in a round about way, you may be heard. It’ll all be ok. You can do it. Posted by bethkolar on September 21, 2011 in Facebook.